I don’t know about you, but I can’t take any more of this rain. I sit here on a dreary Monday afternoon writing about what I cooked on an even drearier Friday afternoon. Good thing cooking always lifts my spirits. As I took out the ramps that had been sitting in the fridge since my last trip to the farmers market I instantly felt better about the weather situation just outside my kitchen window. With a little inspiration from Smitten Kitchen, and some leftover rosemary in the fridge, I spent the rainy afternoon making a sunny spring salad. Preheat oven to 400°F. 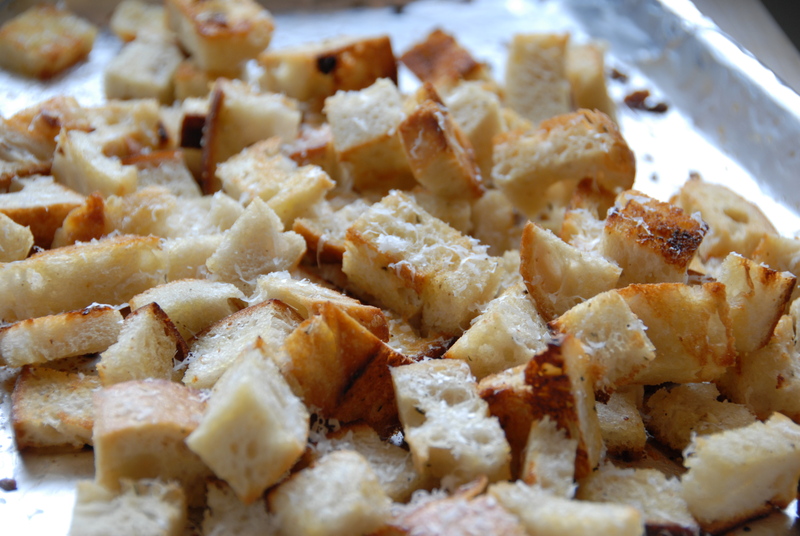 On a baking sheet, toss the bread cubes with olive oil, garlic, grated parmesan, salt and pepper. Bake for about 10-15 minutes, flipping them once or twice. The bread will be crisp and lightly browned. To be honest, I sprinkled the hot croutons with a bit more parm once I retrieved them from the oven; I suggest you do the same. Set aside. Everything comes together pretty quickly, but the vegetables need some prep work. First, the leeks. Cut off the dark green tops and trim the ends. Halve each leek lengthwise to within 2 inches of their root end. Rinse well under cold running water to wash away the sand and grit. 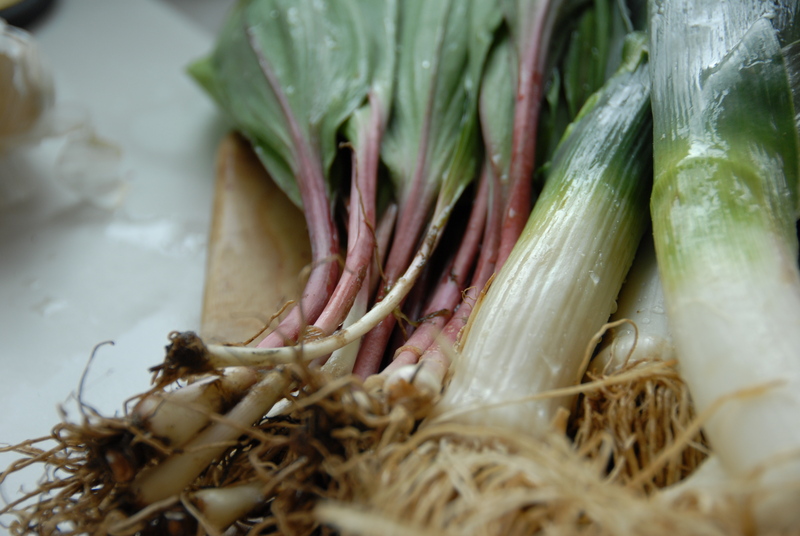 Cover leeks with cold water in a large pot, add salt and simmer, uncovered until tender. This will take 15-20 minutes. Transfer the leeks to a bowl of ice water to stop the cooking and then pat them dry with paper towels. Don’t drain the cooking water, leave it boiling – you’re going to add the asparagus in just a minute. Trim off the tough ends of the asparagus and cook it in the boiling water until crisp-tender, about 3 minutes. Transfer to a bowl of ice water, drain and pat dry. 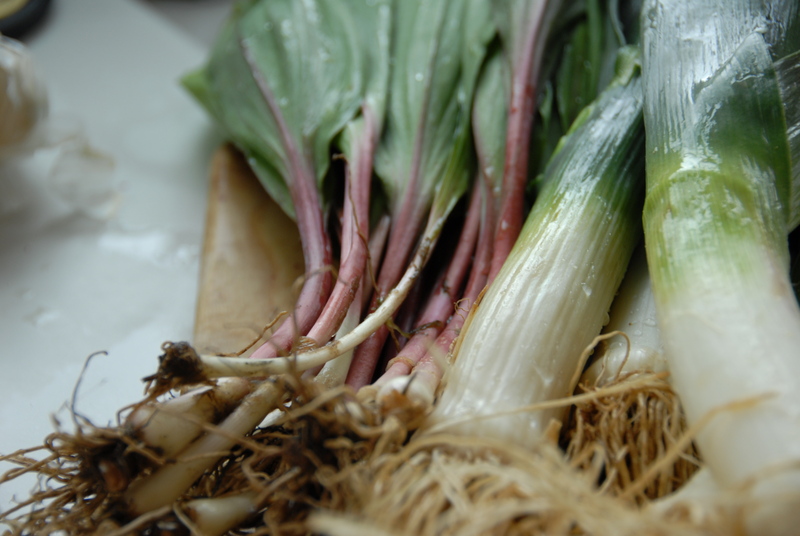 For the ramps – I just quickly blanched them – a few seconds in boiling water, a quick dip in the cool water and let them dry on paper towels. 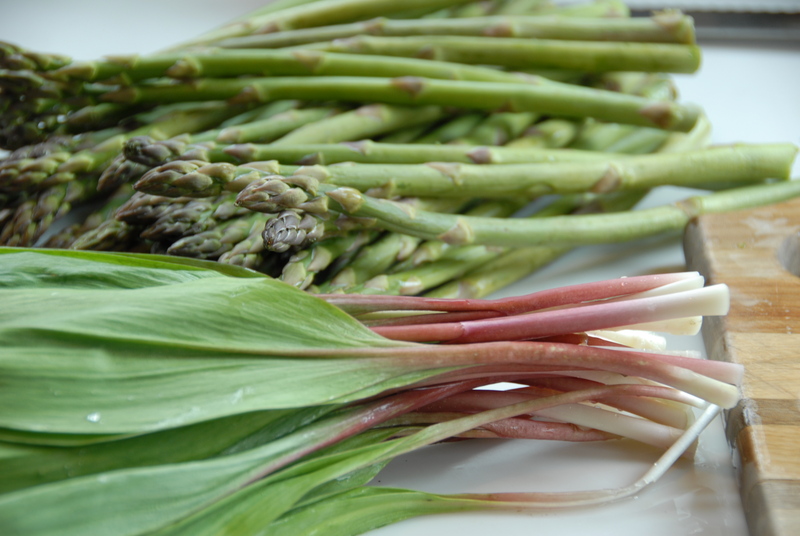 Once drier, cut the leeks, asparagus and ramps into 1-inch segments. The leeks will be a little slippery but just use a little force, and a sharp knife and you’ll make it through. Put them in a large bowl along with the beans and bread. 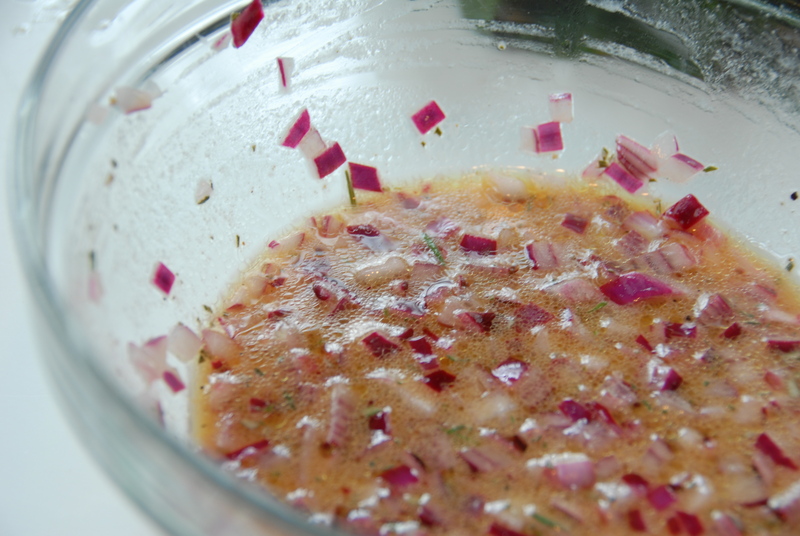 To make the vinaigrette, mix the red onion, rosemary, vinegar and lemon juice in a small bowl. Wisk in the olive oil and Dijon, season with s&p. Pour it over the combined salad ingredients and mix well. The rosemary compliments the onion flavors marvelously. Not to mention – who doesn’t love a salad that’s actually made with half a loaf of bread? That will brighten anyones day. 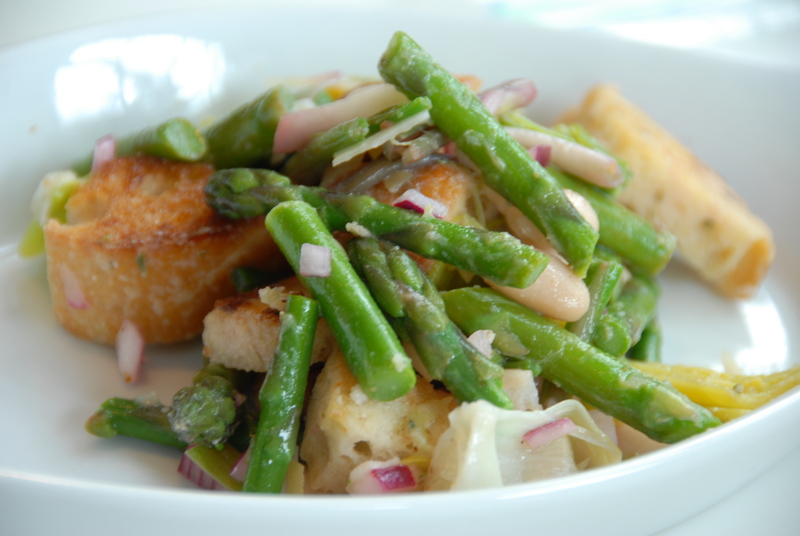 This entry was posted in Ramps and tagged asparagus, bread, dijon mustard, leeks, panzanella, ramps, red onion, salad, spring vegetables. Bookmark the permalink.